Following various site access challenges in 2014, the Green Living Show decided to move to the Toronto Convention Centre in 2015. However, their dates were coincided with the Cottage Life Show at the International Centre. Up Marketing was tasked with creating the online marketing campaigns that would inform the public of the new dates and venue – and bring them in. For general awareness, a Google Display campaign was created to target consumers with identifiable green interests throughout southern Ontario. Bidding was weighted based on geographical proximity to the Show. We then segmented the show’s market into five distinct target groups and placed ads on sites related to their interests. 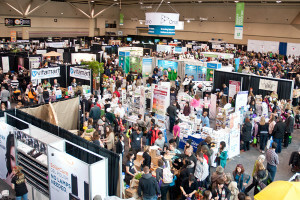 A corresponding Google Search campaign was then constructed to present Text Ads in response to searches relating directly to the wares and services offered at the Show. The Display campaign was managed to maximize reach and efficiency, including all the GTA’s major news websites at a small fraction of the cost of booking them directly. Search click costs were controlled to balance target group exposure, ensuring that EV Test Drive, Sustainable Food & Beverage, Health & Wellness, Fashion & Beauty all got their fair share. When an E-Waste-for-Show-Admission promotion was launched, Up Marketing had an “ad extension” up and running throughout the relevant segments of the Search campaign to advertise the offer, the following day. The results speak for themselves. Display impressions targeted at 1 million exceeded 1.5 million; click volume targeted at 4,000 came close to 5,000 and; most importantly, show attendance hit an all-time record of 38,000. Direct sales were so strong that many vendors found they had insufficient inventory on hand. This all was achieved with a much smaller marketing budget than previous years. 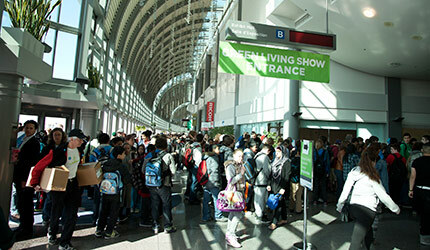 The cost for Up Marketing’s online campaigns that contributed to the Green Living Show’s record turnout in 2015? Less than a single print ad!